Follow me on a dragon hunt along this bracken bordered path into the bog. Don’t be afraid, but be careful where you put down your feet. The bog is never as it seems. Moss that appears ankle deep will sometimes make you sink up to your hips in green. Grassy and muddy open areas can be as deceiving and treacherous as quicksand. Known through the ages as protectors of treasure, dragons are part of the lore of many cultures. Sometimes good, sometimes evil, in Medieval England they were symbols of greed. Back then, conquering a dragon was a metaphor for conquering one’s desires for the material world. 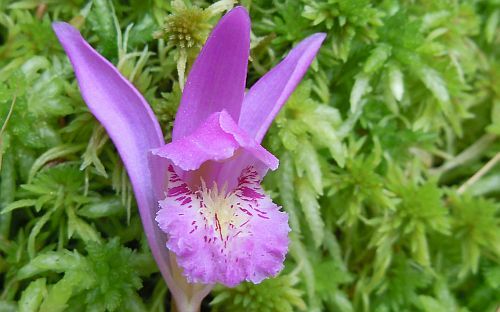 Nobody knows what treasures are protected here by these dragon’s mouth orchids. One can only imagine. Dare you look down into the mouth of a dragon and ask? 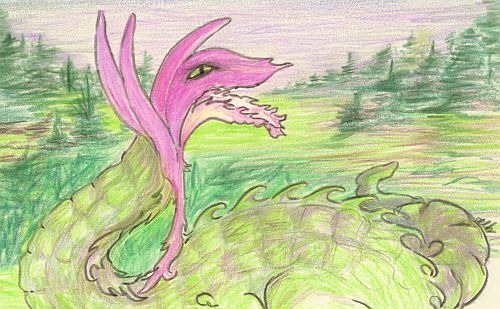 Although they have mouths, these dragons aren’t likely to tell us what treasures are buried here. They’ve kept their secrets well hidden for centuries already. Why tell now? 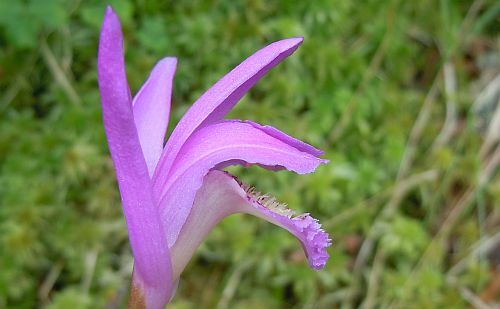 More information about the dragon’s mouth orchid can be found at John Crabtree’s Mushrooms and Wildflowers of Nova Scotia. It may be the way of humans to want development to cease once their home is built on the edge of the wilderness but I still shudder every time I see tracts of land cleared. I realize that before my home was built on this spot, many wild creatures made this acreage their home. Trees once stood where my driveway now covers the ground with gravel. Yesterday I went looking for amphibian eggs in a spot where I had seen them in a waterway near the bog years before. Chainsaws tore through trees in the vicinity throughout the afternoon. 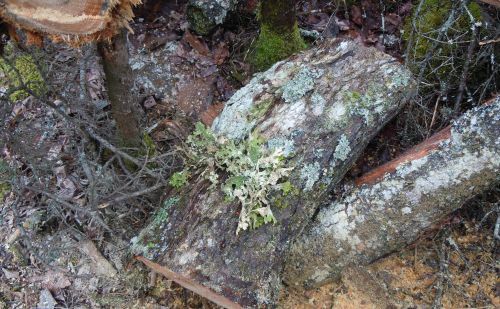 I also looked for Boreal Felt Lichen, an endangered species that seems like it would thrive in this neck of the woods. 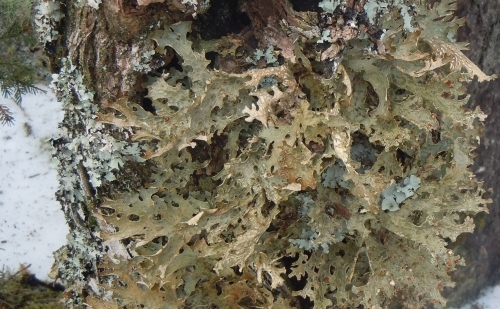 Though none was found yesterday, I did find a cluster of foliate lichen that I had seen earlier this year. Unfortunately, this time, the tree was on the ground, freshly sawed into pieces, a casualty of the surveyor’s line. These lands are likely slated to be developed soon. 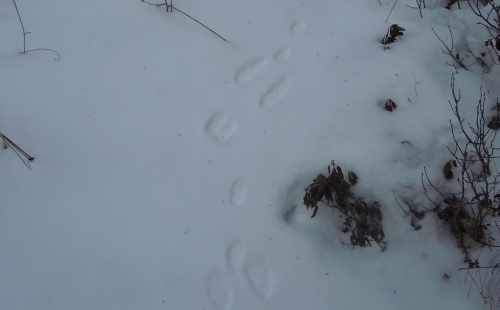 yet, fresh evidence of porcupine, hare and deer activity was everywhere to be found. It’s a shame that so many animals will be displaced and that all these lichen-covered trees will eventually be covered with weedless green lawns and paved driveways. 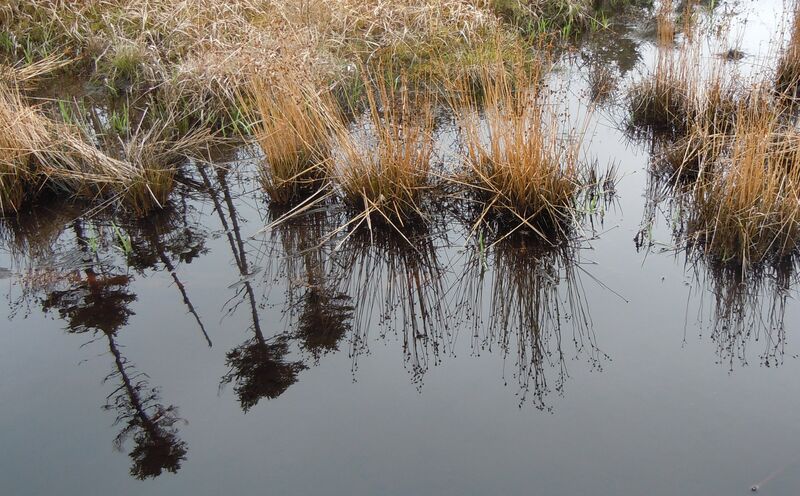 Bogs are often considered wastelands by developers who want to fill them up. That saddens me just as much as the demise of the trees. New trees can be planted on cleared land but a bog can’t resurface once it’s been filled with rubble. Her singing was barely audible over the roar of the chainsaws. The ancient Celts believed that barren wastelands existed because their leader and people were cursed. Surely whether or not a space is a wasteland has more to do with one’s point of view than a curse. A few days ago I visited a bog that I hadn’t seen since Hurricane Juan hit in 2003, destroying the old logging trails I used to follow to reach it. 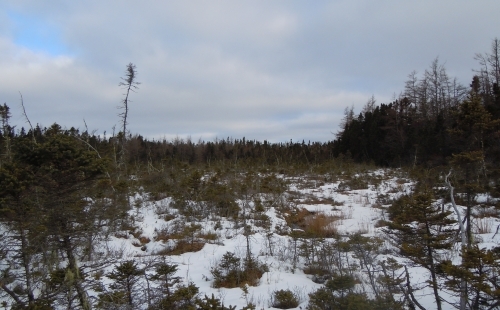 Due to the slow tree growth typical in bogs, it had changed very little. 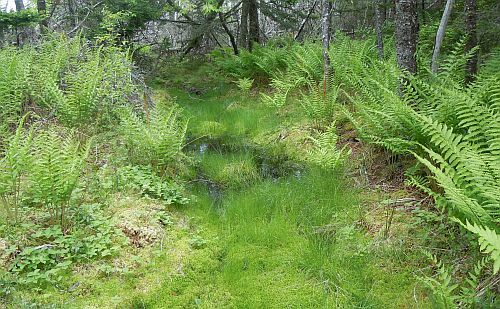 For over a decade I walked through this bog daily with my dog, careful to place my feet on higher ground so that I wouldn’t sink into the bottomless black mud. 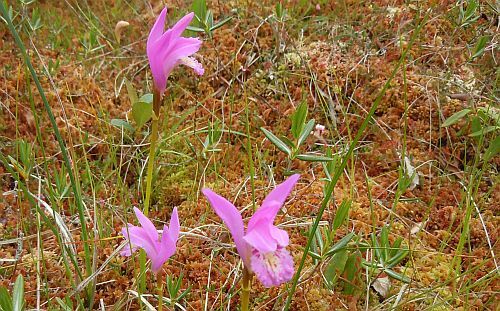 Though the bog looked especially pretty in spring with its bright pink orchids and rhododendrons, in winter it could be equally wonderful. One cold day I suddenly heard wings flying above me and was surprised to see two bald eagles hunting for hares or other bog-dwelling prey just a few feet overhead. Bogs were once considered magical places, probably owing to their reputation as cursed wastelands. Some Northern European cultures sometimes buried their dead in bogs and it’s suspected that human sacrifices were made there during the Iron Age. Bogs were also places where treasures were hidden from invaders. In 2006 the Irish found a thousand year old illuminated psalter manuscript in one of their bogs. 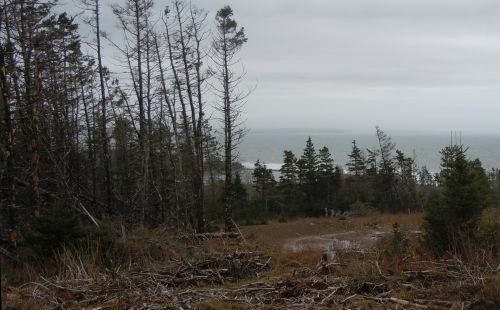 Could treasures still be waiting to be discovered here in Nova Scotia? Today bogs are just beginning to be valued for their role in absorbing extra precipitation and acting as filters for air and water borne pollutants. Sphagnum moss which is abundant here is also being studied for its role in absorbing oil from disaster spills. 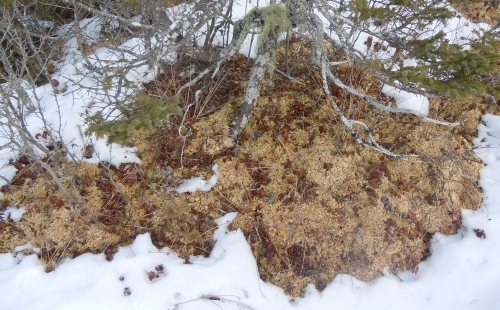 Many of the lichens that hang from the trees in bogs also absorb moisture from the atmosphere. The most marvelous of these can convert nitrogen in the air to a form usable by plants and animals. 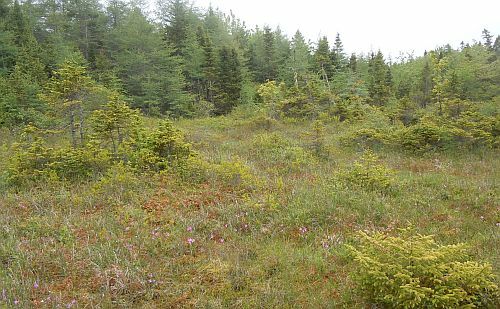 Unfortunately, in Nova Scotia, bogs are still considered wastelands and cheap real estate. Locally, they continue to be filled with rubble and developed into subdivisions. If the original evergreens left standing at the edge of new streets appear stunted, chances are that the homes nearby were built in a bog. Sadly, once bogs are filled, they cannot go back to their original form. If urban planners refuse to consider the role bogs can play in alleviating flooding and cleaning the atmosphere, perhaps we really are a people cursed.